When it comes to green design, there are some really cool eco-friendly artists out there doing some amazing work. Here at The Chic Ecologist, we like to bring to light some of these beautiful sustainable designs. I have had a lot of great ‘reader finds’ and small design shops and artists send me some of their works and designs, so it is time to share! Nikki Montoya is a jewelry designer that comes to us from Southern California with an eclectic collection of jewelry inspired by the past. Sustainable materials, salvaged rarities and vintage charms are brilliantly combined with a contemporary vision and technique. Each one of these unique and inspired handmade creations are one of a kind. I am a particular fan of the bangles (pictured) and “Sparrows”. Check out her website and find her jewelry sprinkled in a handful of Los Angeles area boutiques. Miami based Argentinian furniture designer Facundo Poj has a scattering educational and experience background ranging from a master builder and Architecture school to a degree in Urban Affairs and Environmental Problems. His works consist of handcrafted junkyard objects with historic value. He is interested in subjects which contain a soul and have a lasting quality to them. Researching new ways of using materials outside the large scale mainstream manufacturing; he employes materials like salvaged cardboard or engineered bamboo. I particularly enjoy his repurposed bathtub line of furniture including the bathtub chaise lounge. The C5 online boutique features some of the top sustainable jewelry designers in the US. No longer do you have to sacrifice beauty for sustainability. In addition to the online boutique, C5 offers custom jewelry services. 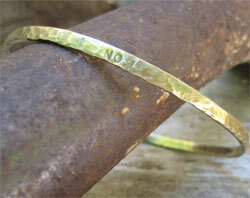 All jewelry is made in the US from recycled precious metals and ethically sourced gems.